You will also need a mold of your choice–I have the traditional wooden mold, but really any will work. Line it with plastic wrap press the dough in (a little at a time), take it out, and arrange it onto a cooking tray. But first for the dough–sift the flour and the sugar into a big bowl. Mix well. Heat the oil and butter in a pan with the cardamon and cloves–once the butter has melted, and the mixture is heated through–NOT BOILING–sift it all onto the dry mix (the flour and sugar). Mix with a wooden spoon (be careful it is hot) and then once it warms down a little you can use your fingers. Using whatever mold you like start shaping them, and arranging them onto trays. Bake in a 350 degree preheated oven–for about 15 min–just until they turn a little golden in color. If you cook them more than that, they will either burn from the bottom, or they will be hard as rocks. So, watch ’em. Enjoy with Arabian coffee, or tea–preferably sugar-free. 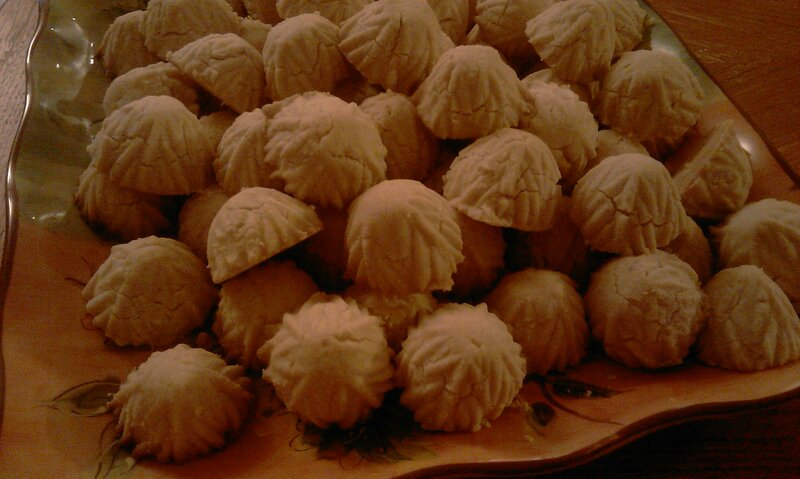 They may be a little different–I know the ones you are talking about :) I have a couple of Sudanese friends whom I have asked for cookie recipes–their’s are delicious maa sha Allah–I plan to insha Allah try both of them out and post them. Hello sister how are you? Well I have been trying to make ghreybah for ages now but the problem is they come out hard instead of crumby and melt in your mouth type. It is really furstrating !!! But any ways I don’t have canola oil would vagtable oil be ok?? And if you can pls let me know what degrre F i should be puting my oven heat on. I have a gas stove and so is my oven. May allah reward you with your share of knowledge insha’allah ws wer web. Yes you can use vegetable oil. You want the oven to be at 350 degrees but keep your eyes on them, if you let them brown they will get hard. So, just as they are turning yellow you want to take them out. I have another recipe for cookies that melt in your mouth that i will post on here insha Allah soon. Let me know how they turn out insha Allah. LOL!! Am always online Ummu Menal :) Yes, please update me will you. I made Qatayef today and they turned out yummy maa sha Allah. I believe it’s 8 tablespoons insha Allah. I am not home, so no cooking for a while so I can’t check my butter. But i believe it is 8 tablespoons.